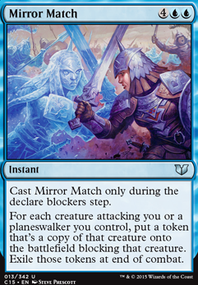 How does portcullis interact with enter the battlefield destroy effects? Flying When Jace's Mindseeker enters the battlefield, target opponent puts the top five cards of his or her library into his or her graveyard. You may cast an instant or sorcery card from among them without paying its mana cost. 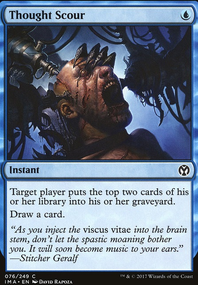 Jace's Mindseeker ; a 4/4 flyer and you have a chance to cast from your opponents' libraries whenever it enters the battlefield; nice value! Mentor of the Meek ; some sweet extra draw when you're blinking your weaker creatures. Eerie Interlude ; wonderful way to blink stuff at instant speed in any phase (nice response if someone tries to go for a wipe). Hope this helped a bit. Cya! 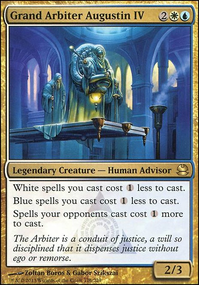 Ashen Rider is a great card to blink but a little costly, Conjurer's Closet is another good one, I also run Venser, the Sojourner , Jace's Mindseeker , and Magister Sphinx is also good. 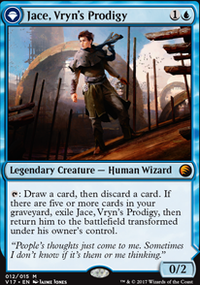 Oath of Teferi , Venser, the Sojourner , Noxious Gearhulk , Ashen Rider , Angel of Despair , I am personally a big fan of Gonti, Lord of Luxury , Jace's Mindseeker is decent, Conjurer's Closet for sure... maybe Jace, Unraveler of Secrets for top manipulation. Day of dragons looks awesome do you think Synthetic Destiny would be a worthy include as well? 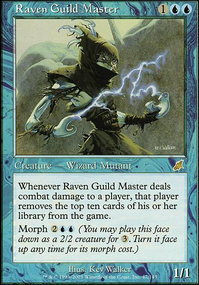 I don't have a specific outlet for the Peregrine Drake combo but both cards are super powerful in blink and getting infinte mana is always helpful:) Do you think I should work some outlets in for the possibilty of comboing off or is it not worth it? so i don't know why your running Trinket Mage, doesn't hit like anything in your deck. In my opinion Boreas Charger isn't very good, and same goes for Pilgrim's Eye. Eldrazi Displacer can only be activated with like three of your lands, so i don't think its worth running. Mulldrifter is good here, might as well run it instead of one of your draw cards, definitly better then Treasure Hunt. Day of dragons is insane in this deck. Basically you get a whole bunch of 5/5 flyers, hit you opponents with em, then flicker it to get a bunch of etbs from your minions, and then get the 5/5s back. Also makes you basically immune to board wipes, including your own. Angel of Despair Luminate Primordial and Ashen Rider are good high end to help you beat down your opponents with high value etbs. 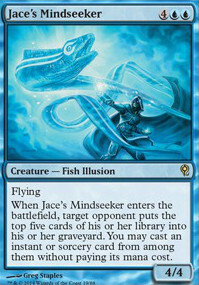 if you like gonti then Jace's Mindseeker is for you. 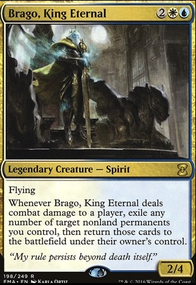 I had a Keiga deck similarly themed, tho not this budget, and it is really fun. From my experience the deck runs into issues when there is nothing to steal (or worth stealing). I ended up cutting my deck to ~10 clone effects and adding in evasive draw, control, or interactive creatures, like Mulldrifter, Guardian of Tazeem and Jace's Mindseeker. Wizards is an interesting direction and seems fun too! 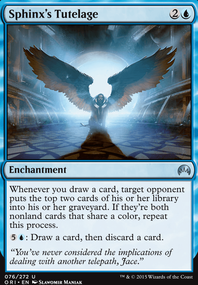 Arcane Denial and Dream Fracture are my go to "don't-feel-bad" counters because both parties get to draw and a threat is dealt with.